There are quite a few ingredients that go into making a ski day one to remember. Great weather, cold dry snow, and distant untracked powder glades are just some things that come to mind. Another ingredient is the skill set you bring to this perfectday. Watching videos of skiers shred almost vertical lines on distant Alaskan peaks, although inspiring, can also be daunting and beyond most skiers ability. What is in your reach though, is that special feeling you get when your skiing skill comes together on this perfect day. When you have been working on a particular elusive skill you just couldn't get, and suddenly you really feel it. That perfect rhythm and the sense of floating, almost dancing, down the fall line, and you look back at a perfect line of turns and the smile on your face just gets wider. Tokachi Mts. Climbing the "D Ridge" on skins, looking for first tracks on a bluebird day. Our Backcountry Ski School can help you with just that special feeling. Whether you are new to Alpine Touring gear, powder skiing, want to improve your telemark skills either on or off piste, or just wish to feel the rhythm of kick and glide as you almost effortlessly cruise along the trials. Please see below for details and come to our shop in Furano, 100 metres from the Kitanomone gondola to book your lesson or day of backcountry learning with our experienced and qualified guides and ski instructors. Rates. Lesson and Skill's day's rates are per person. For non private lessons, rates are a sliding scale from 1 to 6 persons. . Contact us for detail pricing. Private Tours. All lessons and day tours can be booked as private instruction, either prior to arrival or while here. Prebooking. 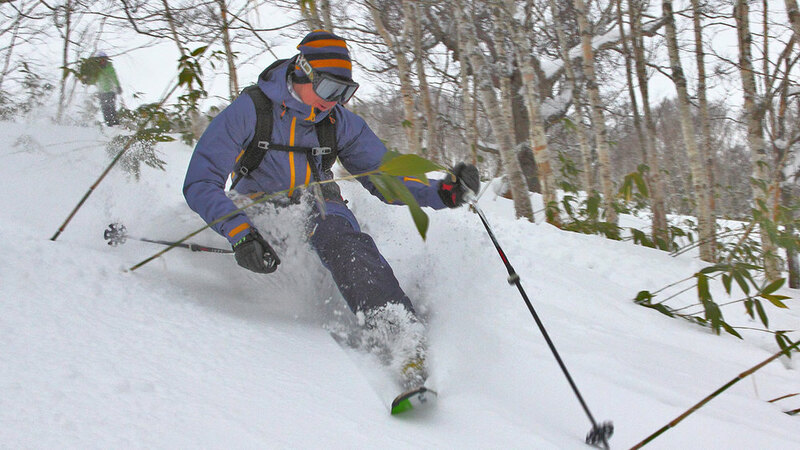 Lessons can only be booked directly with our shop in Furano and are dependent on availability. Guide Ratio. We have a lesson ratio of 6:1. Larger groups will require two instructors. Booking Form and Travel Insurance. All participants are required to sign a booking form and waiver of liability before the can join the lesson. You must have appropriate travel insurance. Payment can be by cash or credit card on the day of booking in our shop at Kitanomine, Furano ski resort. Required Equipment. For all lessons and backcountry skills, skis and skins are included. For Telemark lessons, boots are also included. If you ever wanted to learn the basics of backcountry skiing then this short course will get you started. We provide all the equipment and guide/instructor. You will learn the basics of Alpine Touring bindings, climbing skills, how to use skins and their care on a tour, appropriate clothing choices and basic avalanche awareness skills including beacon search. Clothing choices for comfort and safety. AT binding types and how to use them. Applying and caring for skins. Contact us for all details and booking form. Subject to availability. Miha Grilj, telemarking Tomamu early season. Free the heel on this half day session. After setting you up with our telemark boots and skis at our shop, our instructor will take you out for a 2 hour, half or full day of exploring and adventure. For beginners, you will start with a basic telemark lesson that will see you “bend the knee” from the very start. After which we will spend the time working on your skill level; For the hlaf and full day lessons, you will explore both on and off piste areas in and around the Furano resort. Please note that telemark lessons can be tailored to different destination and for either on piste or off piste. Both Furano and Asahi Dake have cut cross country tracks for both classical and skate skiing. This a great addition to your ski holiday, to learn new skills and stretch your legs as you glide smoothly and efficiently through the trails and mountains. Our lesson rates also include rental of classic cross country skis and boots. Two Hour: ¥4000/per. Min 4 - Max 6. Half day (3.5 hours): $5,500/per. Min 4 - Max 6.